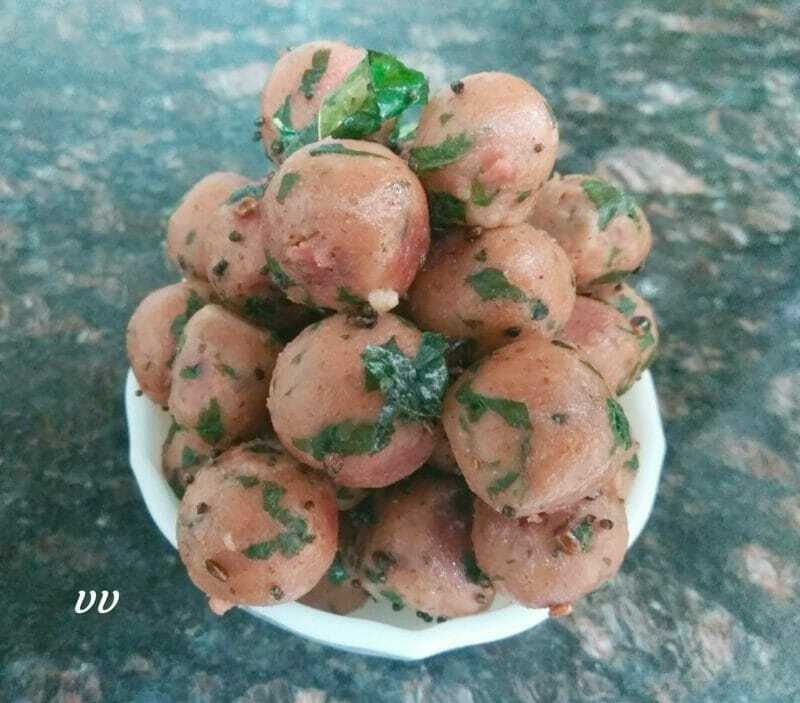 Ammini Kozhukattai is a traditional recipe of Tamilnadu. Even though I shared a simple version before, this is a perfectly balanced nutritious dish as almond flour, radish greens and beetroot powder are also added. In a 2 Ltr cooker add water, salt, green chillies, beetroot powder and oil. Close and cook for a whistle. Switch off. Release pressure manually and mix in jowar flour. Close the lid with weight on for 20 minutes. Open the cooker, add almond flour and radish greens. Mix well and knead to a soft dough by greasing the hands. Divide the dough into pebble size small balls and give a perfect round shape. Steam the balls for 10 minutes. In a pan add oil and do the seasoning. Transfer the steamed balls to the pan and toss for 5 minutes on medium heat. 1. The above procedure is called Autolysis and is one of OPOS techniques. 2. Instead of beetroot powder, 1/4 Cup juice can also be used. Reduce water accordingly. 3. Instead of radish greens, spinach or fenugreek leaves can be used. Very creative healthy recipe! Thanks Vijaya! Please try and share your experience. Thanks so much for the motivation. Looking forward in trying this VV ! Looking forward to your validation!